A bare-chested man, holding a screwdriver, racially abused a member of staff at a busy Denbighshire KFC restaurant, a court has head. Red Vaughan, 29, also subjected police officers to a tirade of racial abuse when he was arrested at the store on Wellington Road, Rhyl, on 8 August 2017. Vaughan, from Blackpool, admitted a number of racially aggravated charges. He was jailed for 12 months at Mold Crown Court on Thursday. 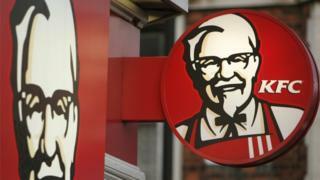 The court heard he racially abused a female KFC employee because he believed she was Polish. Before that, he had made racial remarks towards an Asian man at another shop and asked for a gun, apparently to shoot minority groups of people. Vaughan, who denied being a racist, had spent the day drinking and claimed he could not remember what had happened. He admitted racially aggravated harassment and two charges of racially aggravated threatening behaviour. Sentencing him, Judge Niclas Parry described his actions as "disgusting anti-social behaviour". His behaviour "embodies what is really sick about current society", he said, where some people sought to "bully and racially abuse" other members of society based on their ethnicity and race. "The public is crying out for something to be done to put a stop to this kind of behaviour," Judge Parry added.